Ketomac shampoo contains Ketoconazole as its main ingredient. It is primarily used for fighting dandruff and other scalp conditions. Doctors prescribe this shampoo to patients who are dealing with acute dandruff. Other than causing embarrassment, dandruff is also one of the primary causes of hair fall. It is because dandruff makes the scalp very itchy and it makes the person scratch. Scratching is known to loosen the roots, which result in hair fall. Therefore, it is important to deal with dandruff to prevent hair fall and other hair ailments. Use twice a week for 4 weeks. After the scalp has cleared, use KETOMAC Shampoo once a week to prevent the reoccurrence of dandruff and to keep the scalp clear. If you stop using KETOMAC Shampoo completely, your symptoms may reappear. 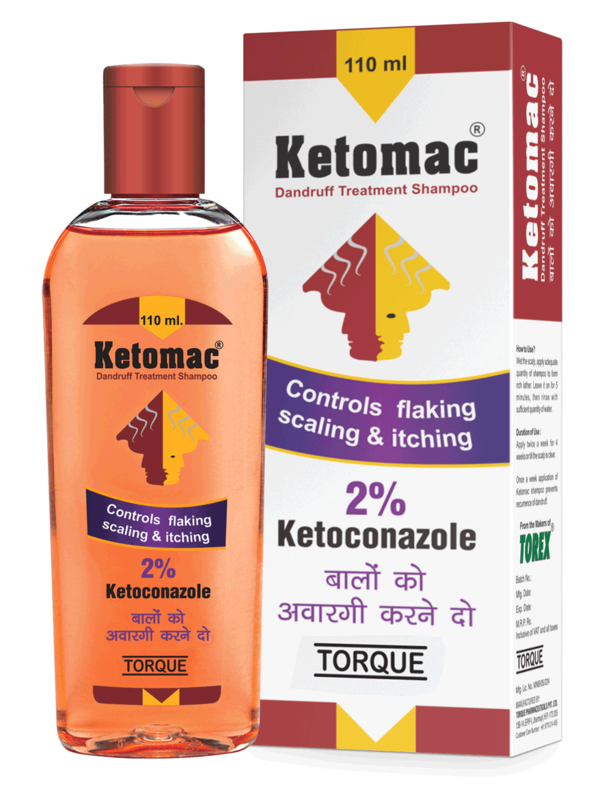 Seborrhoeic dermatitis and dandruff: Use Ketoconazole shampoo 2% twice weekly for 2-4 weeks. Pityriasis versicolor: Use Ketoconazole shampoo 2% once daily for a maximum of 5 days. Store in a cool, dark and dry place. Protect from direct sunlight. Allergy – The Ketomac shampoo isn’t recommended to people who have shown symptoms of an allergic reaction after using it. QT Interval prolonging medications – The Ketomac shampoo isn’t recommended to be co-administered with other medications that are known for causing any specific change in the rhythm of the heart. Side effects may occur in some people due to the use of Ketomac Shampoo. These are usually mild and do not affect everyone using the product. 1. When does the action start? 3. Is it safe with alcohol? 4. Does it have habit-forming tendencies? 5. Is it safe to use while pregnant? 6. Is it safe to use while breastfeeding? The effect is observed after one or two hours of use. On an average, the effect last for about eight hours. Experts do not recommend the consumption of alcohol along with it. It has the possibility of increasing the risk of fainting and dizziness. There was no report of habit-forming tendencies. It shouldn’t be used during pregnancy unless it is extremely needed. Talk to your doctor about potential benefits as well as risks before making a decision. It isn’t safe for breastfeeding women unless it is extremely necessary. Talk to your doctor about the potential benefits as well as risks before making a decision.